As seen on FOX's Good Day DC & ABC's "Let's Talk Live"
Professional cure for chronic bad breath since 1993. Sterile Gauze, 2×2 inch, 400 pcs. Have you ever wondered why mouthwash, with its promises of blasting away all traces of bad breath for hours and hours, fails to live up to its claim? While the answer is right in front of us, it is often overlooked because it is “layers deep.” Let me explain why mouthwash isn’t the magic cure it claims to be. The reality is mouthwash can only create a temporary elimination of bad breath, at best — part cover-up and part odor-control. There are two types of mouthwash products on the market today. First, the widely available, over-the-counter products such as Colgate, Crest, Cepacol, and Listerine – which all claim to eliminate bad breath. The problem? None of the ingredients have anti-bacterial properties. This is a problem since the #1 cause of bad breath is bacteria in the mouth! These mouthwashes mainly consist of essential oils with limited bacteriostatic (slows growth but does not kill) activity. And even then, they cannot eliminate the types of bacteria that cause bad breath. The strong essential oil scents only serve to cover-up the odors of bad breath. The second type of mouthwash products are the ones mainly sold on the Internet like SmartMouth™, Amazing Breath and others. These products do contain anti-bacterial ingredients and will kill some of the sulfur-producing bacteria. However, many who use these products find that the odors of bad breath return well before the promised “twelve hours of fresh breath” have passed. So, why can’t these mouthwash products produce long-lasting, fresh breath since they claim to block sulphur smells and kill bad bacteria? To understand why, you must understand the nature of bad breath. First, the odors of bad breath are the waste products of bacteria. Bad breath bacteria inhabit the coatings (biofilm) on our tongue and live in their own ecosystem. They exist along with the foods they digest – dead skin cells from inside the mouth, dead blood cells from under the gums, mucous, debris, and other foods – and digest these foods, resulting in stinky molecules of bad breath. Second, this coating, or biofilm, is virtually impenetrable to liquids of any kind. The #1 researcher in the field of oral malodor, Dr. Mel Rosenberg, says that biofilms on the tongue “can only be removed by mechanical means” because the coating on the tongue tenaciously grabs onto the tongue surface and gets thicker and more impervious every day. You could say that the bacteria hold on for dear life. Because layers and layers of new bacteria and their food continue to pile on top of the biofilm, it gets thicker and thicker over time. Because these bacteria live without air, the ones near the middle and bottom of the tongue coating can still be alive, spewing out their waste into our mouths as bad breath. And these are the ones that mouthwashes cannot reach. 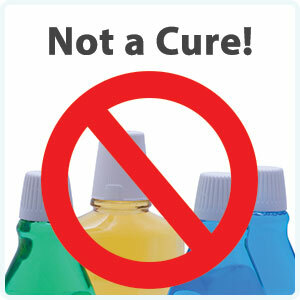 Mouthwash can only reach the top few layers of biofilm – no matter how strong, active, or what ingredients it contains! There are millions of layers of biofilm on the human tongue. All the professional strength, antibacterial mouthwashes like Therabreath, ProFresh, Smart Mouth, and even our own brand, Supreme Breath, are designed to target only the sulfur-causing bacteria and odors. But up to 25% of the people we see have a majority of non-sulphur odor compounds. These odor molecules contain compounds like ammonia which have a horrific odor. Here’s the most important part: everyone has a mix of sulfur and non-sulfur based odors. No one has just one or the other. That means that even the people who get some benefit from the mouthwashes still have some other odors present that can overpower the mouthwash. It is these odors that can accumulate and cause the mouthwash to only last a short time. At the National Breath Center, patients frequently tell me, “my mouthwash only lasts 20 minutes.” In fact, the longer you use a particular mouthwash, the less it works because of this reason. 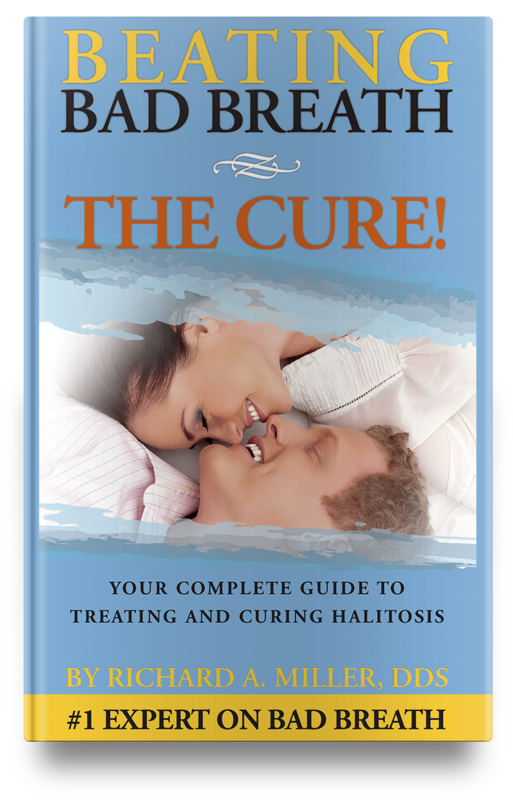 A CURE should eliminate the problem itself, all related causes, and provide the means to keep halitosis from coming back. It does not eliminate the problem but covers it up. It does not eliminate the cause. It does nothing to prevent it from coming back. For some people, using mouthwash a few times or more a day may provide enough relief from the problem. For others who have been dealing with bad breath for many years, no amount of mouthwash is going to provide relief because the bacteria and biofilm have been piling up and creating impenetrable layers for too long. Since the layers of bad breath biofilm can only be removed mechanically, professional treatment with Tongue Rejuvenation™ is the only way to eliminate the source of bad breath for good. Find this useful? Please share. 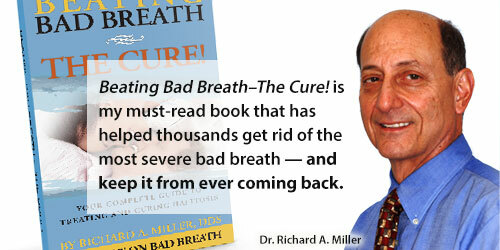 Richard A. Miller, DDS is the founder and director of the National Breath Center located in Falls Church, VA. General dentist for over 30 years and author of two books, Beating Bad Breath(1993) and Beating Bad Breath -- The Cure! (2014), Dr. Miller has been helping thousands win their battle with chronic bad breath using his proven bad breath Total Cure professional treatment. Learn more at National Breath Center. The National Breath Center, located in Falls Church, VA, is a bad breath clinic devoted to removing the oral source of chronic and severe halitosis. Our mission is curing bad breath. For 25+ years Richard A. Miller DDS, founder and halitosis expert, has been helping thousands win their battle with chronic bad breath using his proven Tongue Rejuvenation® professional treatment. Cure Severe Bad Breath For Good!